By 1880 conflict arose between Scarborough Marsh diking company owners and clam diggers, boaters, and fishermen who claimed that dikes shut out the overflowing tides of the marshes, resulting in streams becoming shallower. Farmers supported diking, because it resulted in increased acreage and thus increased salt hay yield. Clam diggers believed they were losing flats and that clams were worth thousands of dollars more than hay. 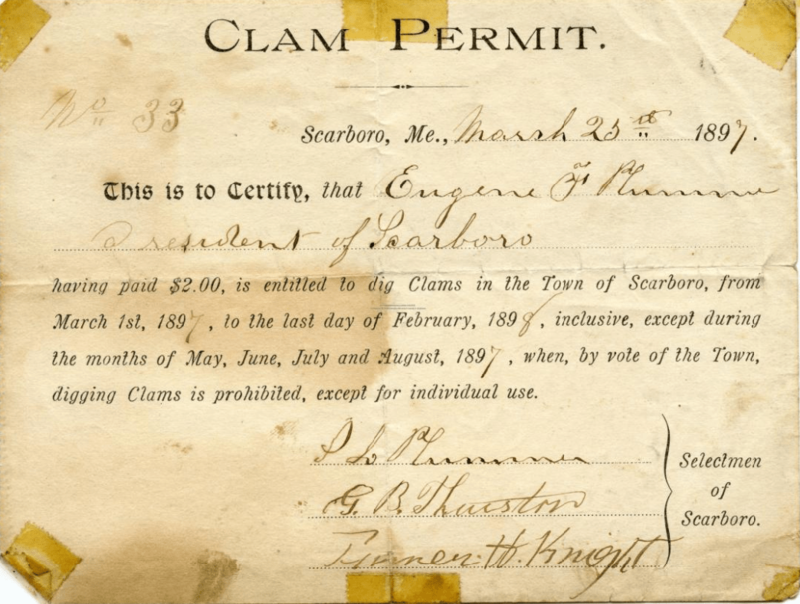 Clam diggers and fishermen petitioned the Maine State Legislature to abrogate an earlier act, which allowed the Southgate Diking Corporation to exist. The abrogating petition was never acted upon by the legislature; it was simply referred to the Commission of Interior Waters. The petition merely showed that a rift existed and that diking caused a negative impact on the marshland. In the 1920s Fred Snow, a clam digger, found a better, more efficient way to can clams and founded Snow’s Canning Company. Snow started his canning operation by buying equipment from a defunct corn cannery. The original brand name was Ossipee, but Snow soon began using his family name. Because of the limited availability of soft-shell clams, another source of clams was needed for clam chowder. The sea, or hen, clam was trucked in from Wildwood, New Jersey. The hen clam became central to the factory’s operation, necessitating a need for more structures, trucks, a machine repair shop, employees and clam draggers. The factory was successful and ultimately employed thousands of people. By 1959 Snow’s had become part of the Borden Corporation. Snow’s Pine Point factory canned its last batch of chopped clams in 1990 after 68 years in business. Although the process of canning clams had become more automated, the manner of handling clams remained the same. 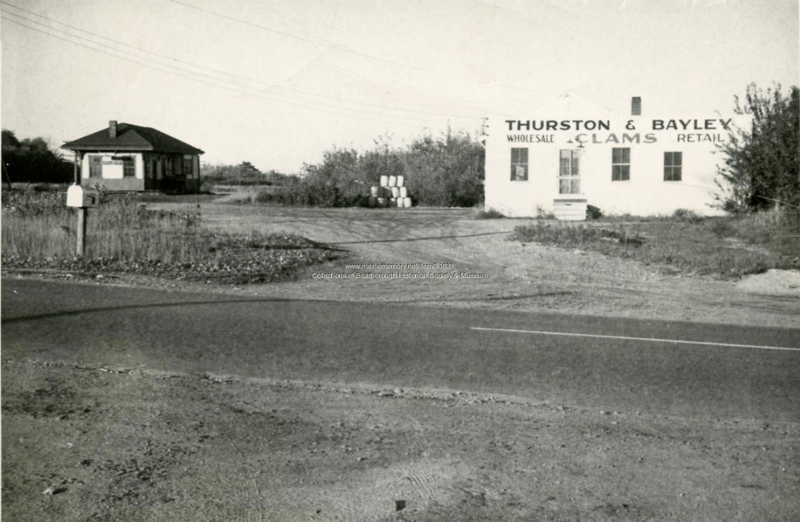 The largest clam dealer of several in the 1900s was Thurston & Bayley on Pine Point Road, almost across the street from Snow’s. Thurston & Bayley not only bought clams from diggers, but they developed a cottage industry. Residents were hired to cut clams and paid by the gallon of meat produced. Clams were delivered in the morning to local homes, and at the end of the day the meat would be picked up. One could work at home rather than going to cutting rooms at various locations. It was common to see a clam tray leaning against every fisherman’s house. The clam tray was used while cutting clams and usually held half a bushel at a time. The original building of Thurston and Bayley is now Bayley’s Seafood Company. The present owner, Stanley Bayley, is a nephew of Paul Bayley, founder of the original company. As regulations became more stringent, the amount of clams was more limited. In 1973 Thurlow’s Shellfish Company, owned by David Thurlow, bought another processor, Googins Lobster Pound. Googins had the first purification system that allowed clam diggers to dig in once-polluted areas. When clams were held for two days in purified water, they cleansed themselves and could be used for food. The combination of this system and clams from open areas generated a larger supply. When Thurlow Shellfish Company closed, Pine Point Seafood Distributors, Inc., which operated wholesale and retail divisions, absorbed the business. The Clambake and Dunstan School Restaurants were the wholesale division’s largest clients. Donald A. Thurlow opened the Pine Point Seafood Market and sold fish, lobsters, clams and other seafood. By 1971 the market moved to a larger building on the Clambake Restaurant property and was managed by Donald H. Thurlow. The market employed a number of people in its cutting room and supplied the Clambake Restaurant. In 1987 still on the Clambake property, the business moved to a new store, now the Nestling Duck Gift Shop, and was operated by Donald H. Thurlow’s grandsons, Michael and John Thurlow. To maintain healthy stocks and assure consumer food safety, clamming is highly regulated. Clams are an important resource not only for human consumption but also for other creatures in the marshes, rivers, and the ocean’s edge. The number of commercial licenses is limited and they are difficult to get. More licenses are available for recreational clammers who want to dig just enough for their families. A serious issue facing clammers is red tide, a naturally occurring toxic algae. Toxins accumulate in mussels and clams during a red tide and can cause paralytic shellfish poisoning in consumers. When red tide occurs, clam flats are closed and clam harvesters are out of work for days or months until the threat has passed. This entry was posted in Clamming and Lobstering, Ocean, Pine Point, Scarborough Marsh and tagged David Thurlow, Donald A. Thurlow, Donald H. Thurlow, Dunstan School Restaurants, Fred Snow, Googins Lobster Pound, Inc., John Thurlow., Michael Thurlow., Paul Bayley, Pine Point Seafood Distributors, Pine Point Seafood Market, Red Tide, Snow’s Canning Company, Stanley Bayley, The Clambake, Thurlow’s Shellfish Company, Thurston & Bayley. Bookmark the permalink.